The modelling of future regional climate change for Germany and Africa using the regional climate model COSMO-CLM (CCLM) comprises basic studies on how temperature and precipitation are affected in general, but also specific impact studies whose results can be used for the planning of adaptation and mitigation measures. For Africa ERA-Interim driven simulations have been carried out within the CORDEX framework. Evaluation studies using two different horizontal grid spacings (0.44∘ and 0.22∘) did not show significant differences in the results. 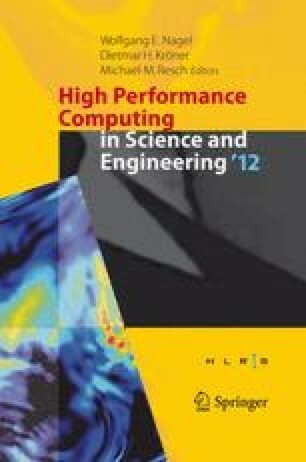 Furthermore, these simulations have been used to perform the transition from NEC computing systems to the new CRAY XE6, and to investigate the impact of this change on the model results, which is very small. The impact of likely heavier summer rainfall on soil erosion in southern Germany is investigated within the KLIWA project “Bodenabtrag durch Wassererosion in Folge von Klimaveränderungen”. The corresponding simulations are performed with very high horizontal resolution (7, 2.8, and 1km). Results show an added-value of the convection-permitting scale (2.8km) in comparison with coarser spatial resolution (7km). The high–resolution simulation also represents well the frequency of high and very high precipitation days. In order to answer the important question how to account for uncertainties in regional climate projections, it is necessary to understand the sensitivity of the model results to various processes, e.g. the initialisation of soil moisture, and to create multi-member ensembles of climate simulations. The latter aspect is tackled within the Helmholtz Climate Initiative REKLIM (Regional Climate Change). In order to capture uncertainties related to the positioning of synoptic systems, a multi-member ensemble of climate simulations is generated by introducing small shifts to the large-scale atmospheric forcing provided by low-resolution global climate models (GCMs). The shifted atmospheric fields are then used to drive CCLM simulations at 50km resolution. These shifts have a considerable effect on the CCLM results, in particular during hydrological summer. Thus, the ensemble generation using the shifting method and, moreover, the usage of different GCMs are valuable for an improved representation of present climate conditions and projecting regional climate change. Soil moisture is a crucial component in the atmospheric water cycle, due to the long-term memory effect of the deep soil and its feedbacks with the atmosphere. Although observational data on the temporal and heterogeneous 3-dimensional spatial distribution of soil moisture is sparse, such information is necessary to initialise climate models–especially for climate forecasts. Sensitivity studies varying the initial soil moisture distribution have been performed with COSMO-CLM. The model was able to reproduce the observations with respect to the temporal evolution of a drought index for the major European regions. Even after several years effects of the soil initialisation could be found. The effect was most pronounced in areas with continental characteristics or at high latitudes (Scandinavia, Eastern Europe or the Mediterranean) and less towards the Atlantic.